Broken headstocks, humidity damage or just a scratch? We offer a multitude of repair solutions! At Guitarlodge we have over 20 years experience in repairing a wide range of fretted instruments. We are committed to maintaining high standards of craftsmanship, attention to detail & excellent customer service. Every instrument worked on is treated with the utmost care using only the highest quality replacement parts & materials. All repairs are covered by our guarantee (please see terms & conditions at bottom of page). Fretted instrument structural repair is a wide ranging subject, however certain repair requirements crop up on a regular basis & are usually attributed to factors such as, general wear, poor manufacturing, humidity damage, misuse, bad storage or just bad luck! Many of our structural damage enquiries relate to accidents that could have been prevented & some of the stories we’ve heard would make a good read, if only there was enough time! The procedures described on this page are our most commonly requested & we hope they’ll provide you with some guidance on instrument repair. Methods & case studies for many of the repair procedures on this page can be viewed in our gallery. Please contact us if you have a structural repair enquiry. If via email please include some good quality photos & an accurate description of the damage/repair requirements. No-obligation (estimated) quotes can be given via email. Better still, pop into our repair centre where we can discuss your repair details & costs. Structural repair pricing included on the prices page should be used as a guide only. Long cracks either side underneath the fingerboard stemming from the nut, but neck structurally still intact. Clean snap at the nut with short break off area. Long slanted break, headstock almost detached, sometimes hanging on by the top veneer. Completely detached headstock, either due to severe impact or failing scarf joints on certain guitars. Middle area neck breaks which are not so common, but we have repaired them. Broken off at the body. Mostly glued in necks & usually a result of poor manufacture or insufficient adhesive. Certain guitars have little strength around the nut area where the truss rod channel is cut. This is true of Gibsons in particular & even a slight impact in the wrong direction can crack this delicate area & we have seen a few! 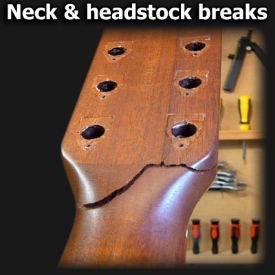 In the event of a neck or headstock break its very important to loosen off the strings, keep any loose fragments, don’t touch & get it sorted quickly! Pictured right: A failed scarf neck-joint. These decorative-protective trims can become loose, cracked, discoloured or broken. We deal with plenty of loose bindings, particularly around curves & cutaways. They are usually attributed to the wood, or the binding itself, shrinking as a result of humidity or temperature change. Often this involves replacing the shrunken section of binding, but can also require additional repairs to the wood & finish. Other repairs are relatively straightforward & often a loose binding can be re-glued easily. Un-treated loose bindings can become more difficult to repair due to the ingress of dirt, grease & dust etc. When binding breaks off or cracks, repairs can be time consuming & tricky, complete replacement is often the only solution. Damaged truss rods can cause all kinds of issues with guitar playability & can go unnoticed for years. The problems we commonly encounter (normally down to over tightening) include stripped threads, seized adjuster nuts, Inactive adjustment due to warped back-bowed necks & snapped rods. There are a handful of repair methods, some are simple, others are not & they vary depending on truss rod type. Unfortunately a new neck can sometimes be the cheapest option! We always use quality replacement truss rod parts & certain rescue-kits. (Availability can vary between makes & models). At Guitarlodge we get a lot of enquiries about finish repairs. These range from tiny surface scratches & small dents caused by accidental contact, to serious damage as a result of guitars falling over or even vandalism. With so many colours & finish types used these days, it’s not always easy to perfectly match small damaged areas, especially when fading has occurred. Badly damaged & larger areas usually require some finishing in order to blend the repair! See customisation & restoration page for finish repair details. Finish repair techniques: We use some common techniques, mainly for smaller areas of damage. Drop-filling & polishing out is normally a good cure for small dents & dings but colour matching can sometimes be tricky. Surface scratches can occasionally be buffed out using professional guitar grade polish, providing they’re not too deep! Deeper dents can be removed with steam, prepared & drop-filled if required. Cracks in the finish can be a sign of a deeper underlying problem & although these can be filled & polished out, the related necessary repairs would need to be carried out beforehand. Early stage symptoms include, slight gap developing between bridge & top (try sliding a thin piece of paper under bridge), tuning & intonation problems, vibrations or resonance when fretting certain notes. Common causes include, effects of temperature change & humidity, broken or loose internal brace, prolonged tension from heavy gauge strings, lack of adhesive during manufacture, inadequate wood-on-wood bond due to lacquer or paint on contact surface, or a failed bridge plate. Repair involves removal of the bridge, correct preparation of the adhesive areas & re-gluing. Even contact & precise positioning is essential for maintaining good intonation. Other structural work may be required when repairing lifted bridges. Many acoustic guitars end up requiring a neck reset. Symptoms include problematic high action even with optimum saddle adjustment (as low as it will go), dip in guitar top under the fretboard extension & raised neck angle in relation to guitar top. Common causes include, effects of temperature change & humidity, prolonged tension from strings made worse by use of heavy gauges. Repair involves removal of the neck by injecting steam into the joint (melting the adhesive), carefully preparing the neck & pocket, re-setting the neck angle by removing slight amounts of material from the lower mating faces of the neck heel & re-attachment. Some localised finishing is required after neck-resetting. Symptoms include, guitar top rotation (bridge tilts forward), strange vibrations & resonance when fretting certain notes, bulging of guitar top behind bridge & cracks in panels. Common causes include, effects of temperature change & humidity, lack of adhesive, stressed joints as a result of prolonged heavy gauge string pull. Repairs vary but most loose braces can be re-attached using careful gluing techniques & internal jacks. Other bracing damage including split or broken braces can be more involved & occasionally removal of the guitar back is required. Lifting pick-guards, cracks, splits, separating tops & backs, sound-hole ring-binding repairs, worn-over size peg holes & cracked bridge repairs. Please note we do not list every structural repair available. If you are considering a repair or would like more information on any of the repair procedures listed, (or not listed) please contact us. Your guarantee: We always guarantee our workmanship on any instrument structural repairs for a period of 6 months. This only applies to the work we have carried out & does not cover string breakages, damage due to misuse or rough handling etc. Structural repair can involve many procedures, please see the relevant pages on this site if you require information on their guarantee details. Turnover times: Time-scales vary on instrument repairs due to many factors including, long drying times between coats if finishes are used, availability of parts, or if set-up work is required. We will try & give a turnover time based on the individual repair requirements of your instrument.